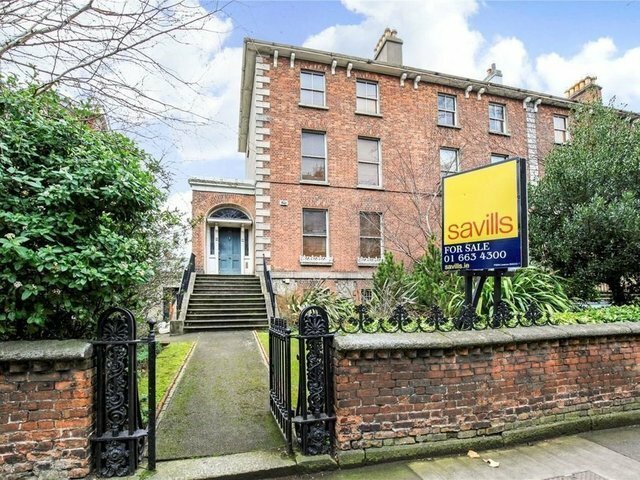 Savills are truly proud to present No. 18 Lansdowne Road to the market. A handsome red brick period property boasting a landscaped rear garden of approx. 50.5 m / 164 ft with plentiful parking accessed from Lansdowne Park. Situated on one of Dublin's most renowned and prestigious roads this substantial family home extends to approx. 372 sq m / 4,004 sq ft. The accommodation features an abundance of period features throughout. There are high ceilings, sash windows with timber frames and shutters, ornate cornicing and centre roses, original floorboards in many of the rooms to list just some of the detail which gives this property such great character. Nine fireplaces in total which have been restored or replaced to create a natural focal point in each of the reception rooms. The plaster work on the ceilings is very intricate with 'egg and dart' coving and beautifully ornate centre roses common place. The property provides for off-street parking to the rear. There is also mews potential subject to the necessary planning permission with access off Lansdowne Park. A flight of granite stone steps leads to the imposing door which features a Georgian fan light and windows to either side. The hall is spacious and has timber floor and decorative corniced ceilings with a centre rose. The main reception room is a magnificent room with light flooding in through the 2 large sash windows. It has a timber floor, decorative corniced ceiling with a centre rose and a marble fireplace. Reception room 2 also features timber floor, decorative corniced ceiling with centre rose and a marble fireplace. Off the hall is found a shower room, with WC, wash hand basin and walk-in shower. This could easily be converted into a study / office or a cloak room with guest WC. The house sits back from Lansdowne Road behind a red brick wall with a wrought iron pedestrian gate leading to the front path passing the mature gardens. A side door leads directly to the superb north westerly facing rear garden. This garden is a major feature of the overall property, such space is rare in this central city location. The garden is well thought out, laid out in different sections with lawns, decking and to the rear there is a large garden house of approx. 13 sq m / 140 sq ft. Throughout the gardens are mature box hedging, shrubberies and specimen trees. There is vehicular access from Lansdowne Park with room for 3 / 4 cars to include using the garden room. Also tucked behind the gates is a small kitchenette and WC. Superbly positioned on an imposing terrace along Lansdowne Road in the heart of Dublin 4 with every conceivable amenity Ballsbridge has to offer and the City Centre is within walking distance.